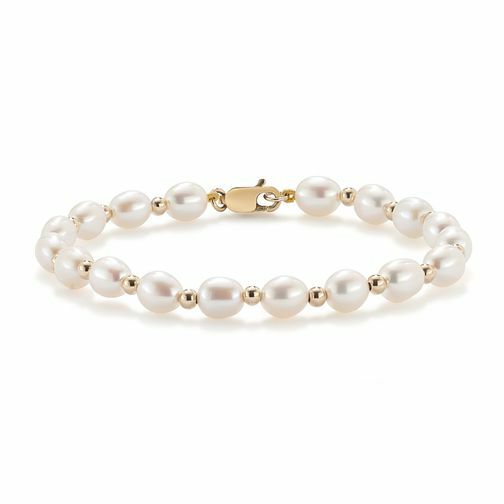 A shimmering cultured freshwater pearl bracelet with alternating 9ct gold beads that adds classic elegance to your day or evening outfit. Fastens with a lobster clasp. Shimmering pearl jewellery for an elegant occasion. 9ct Gold Cultured Freshwater Pearl 5.5-6mm Bead Bracelet is rated 5.0 out of 5 by 5. Rated 5 out of 5 by Anonymous from Beautiful bracelet Lovely bracelet, could be a bit longer as my wrist is small.